WASHINGTON, DC, June 11, 2013 (ENS) – The U.S. Fish and Wildlife Service is seeking public comments on its proposal to remove the gray wolf, Canis lupus, from the federal list of threatened and endangered species. Announced late Friday, the Service says its proposal follows “a comprehensive review” that confirmed the “successful recovery” of gray wolves. Since the gray wolf was listed under the Endangered Species Act over 30 years ago “management actions undertaken by federal, state and local partners” have contributed to the recovery of the species, the Service says. The proposed rule would designate the Mexican wolf, Canis lupus baileyi, as an endangered subspecies. The agency is proposing to expand recovery efforts for the Mexican wolf in the Southwest, where it remains endangered. Under the proposal, state wildlife management agencies would resume responsibility for management and protection of gray wolves in states where wolves occur. Gray wolves were extirpated from most of the Lower 48 states by the middle of the 20th century, with the exception of northern Minnesota and Isle Royale in Michigan. 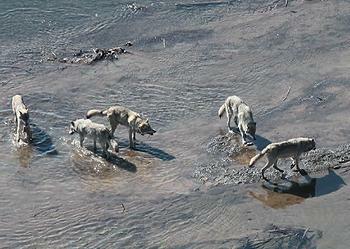 Then wolves from Canada dispersed south and began recolonizing northwest Montana in 1986. In 1995 and 1996, 66 wolves from southwestern Canada were reintroduced into Yellowstone National Park and central Idaho by U.S. federal agencies. By 2002 the Northern Rocky Mountain population exceeded the minimum recovery goals of 300 wolves for a third straight year. They were delisted in the Northern Rocky Mountains in 2012 and Western Great Lakes in 2011. Today, there are at least 6,100 gray wolves in the contiguous United States, with a current estimate of 1,674 in the Northern Rocky Mountains and 4,432 in the Western Great Lakes, according to the Service. But environmentalists believe the gray wolf deserves to stay on the Endangered Species List until recovery of the species is complete. Jamie Rappaport Clark, president of the nonprofit Defenders of Wildlife and a former director of the U.S. Fish and Wildlife Service, said wolves currently inhabit only a fraction of their former range and are still missing from key states like Colorado, California and Utah. “Having just a few thousand wolves in the Northern Rockies and Great Lakes is a far cry from what many of us envisioned for gray wolf recovery when we embarked on this ambitious conservation effort nearly two decades ago,” she said. “Though wolf recovery has made significant progress so far, that is not an excuse to give up now when the job is only half done. Without additional protection and resources from the U.S. 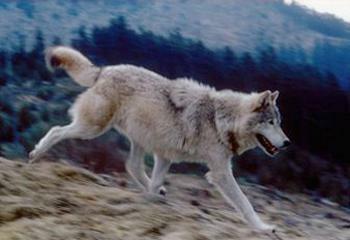 Fish and Wildlife Service, further gray wolf recovery in the United States may never occur,” said Clark. The Service says this proposal is supported by governors and state wildlife agency leadership in each of the states with current wolf populations, as well as those that will assume responsibility for managing wolves dispersing into their states, such as Washington, Oregon, Colorado, Utah and North Dakota. “With a solid state conservation and management plan in place for the Northern gray wolf, an experienced wildlife management agency that is committed to wolf recovery, and established populations recovering at an increasing rate, Oregon is ready to take on further responsibility for wolf management in this state,” said Roy Elicker, director of the Oregon Department of Fish and Wildlife.